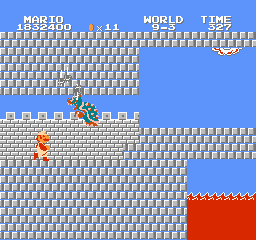 One of the most famous glitches in video game history is the Minus World in the original Super Mario Bros. No one in my family was ever able to get there, but I’ve seen videos of it. Basically, there’s a way to walk through the wall next to the exit pipe for World 1-2. This will bring you through to where the warp zone is, only the first pipe will take you to what’s identified as World -1. It’s an underwater world with the same template as World 7-2, only it never ends. If you go through the exit pipe, you end up at the beginning again. It’s sort of a purgatory for Mario, and while it’s an interesting trick it’s not at all something rewarding to find. In the Famicom Disk System version of the game, World -1 is instead a version of 1-3 that functions as if it’s underwater, even though there’s no water on the screen. 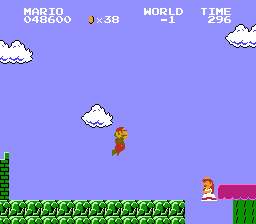 There are also several Princess Peaches floating in midair (or is that mid-water?). World -2 is identical to 7-3; while World -3 is like 4-4, except with flying Bloopers that can be stomped, no Bowser, and no Mushroom Retainer. You still get the message about the Princess being in another castle, though. Actually, she’s floating around two levels back. There’s also a way to hack the American version and access a few more glitchy levels. So what is this weird Minus World? Is it like Minusland in Charlie and the Great Glass Elevator, where Grandma Georgina ended up after an overdose of youthening Wonka-Vite? While a tempting idea, you’ll notice that what looks like a minus sign is actually the dash that can be found in all world numbers, meaning World -1 is really World [Blank]-1. In fact, due to some hexadecimal reason, it’s World 36. There are, in fact, 256 worlds in the SMB data, but aside from the the first eight, only 36 is accessible through normal game play. Others can be reached by hacking the game, but they’re all junk data, and most aren’t playable. When Shigeru Miyamoto heard about the glitch, he intentionally put a World 9 into the Japanese SMB2, later brought to the United States as The Lost Levels. You could only reach it if you completed the entire game without warping. Nicknamed Fantasy World, its levels contain many oddities, but are fully playable. World 9 is a continuous loop in the original Famicom version, but The Lost Levels adds four other bonus worlds. 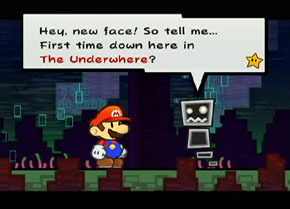 In Super Paper Mario, a game I have yet to play, there’s a place called the Underwhere that’s basically the Mushroom World’s land of the dead. Like the Greek Asphodel or the Jewish Sheol, it’s neither a place of reward or punishment, simply of eternal boredom. There are several direct references to Greek mythology to be found there, including the River Twygz and its ferryman Charold, and a three-headed Chain Chomp who guards the place. The reason I bring this up is that one of the Shaydes there refers to the place as “World -1,” a joke on the famous glitch, and perhaps on how you couldn’t escape from it. It’s actually World 7-1 in the story of Super Paper Mario, but the world numbers always refer to different things in different games. I blame redistricting. This entry was posted in Greek Mythology, Mario, Mythology, Video Games and tagged asphodel, chain chomps, charlie and the great glass elevator, charon, king bowser koopa, minus world, minusland, princess peach toadstool, roald dahl, sheol, shigeru miyamoto, super mario bros., super paper mario, the lost levels, underwhere. Bookmark the permalink.